Sunday 21 Apr - Latest - See listings below for the latest deals. Voted as one of the best new toys for 2010 by a panel of expert toy retailers at the London Toy Fair, the Little Castle Magical Playset is set to be one of the must have toys of the year. From the award winning TV programme Ben and Hollys Little Kingdom, the playset comes with Holly's fairly wand, which when waved, magically completes chores around the castle with 5 magic spells! (cleverly with the use of magnets). The toy chest opens, the bath will fill, the fridge will open, the fire will light and washing will hang itself in the courtyard. All from Hollys magic wand. 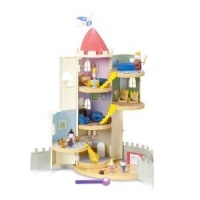 The Little Castle Magical Playset features six rooms with accessories which have many features to play with, including filling the royal bath with soapy bubbles. 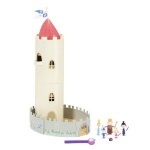 Suitable for ages 3 plus, the Castle Magical playset comes with the castle and courtyard, the figures Princess Holly (and her wand), Nanny Plum, Ben Elf, Gaston with King & Queen Thistle. In Holly's magical bedroom, tuck her into bed or dine with the Royal Family in style, this sturdy playset is sure to make your little girl happy. As innovative and creative as the show itself, this is the ultimate 'must have' Ben and Holly toy. At Stock Informer we automatically check online stock at least every 60 seconds. When stock is found, you are the first to know about it via our Stock Alert webpage, email and text message alerts. Unlike other stock checkers, we also track high street shops local to you, with a free email service to alert you when the Little Kingdom Castle Magical Playset is found in stock.